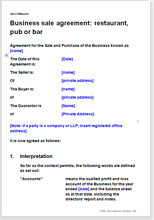 Restaurant, pub or entertainment sale and purchase agt document a modern and full version with warranty menu of 120 items, includes leasehold transfer and freehold agreement for sale. This document is very comprehensive. Before you select it, you might consider the alternative versions, already tailored to the most common business uses. They are listed in the column on your right. As a buyer, you will probably be buying the property or at least taking over a lease. Many of these agreements include a transfer of a lease and / or an agreement to buy a freehold. We give you more information about these procedures in the drafting notes that come with each document.